Throughout the 2016 presidential campaign, Donald Trump consistently broke from political orthodoxy in his effusive praise of Russian President Vladimir Putin. His glowing statements on Putin have become central in stoking the suspicion that he and his campaign were somehow connected to Russian interference in the election. A CNN KFile review of Trump’s public statements — from the years immediately before his presidential campaign to present — reveal that Trump has contradicted himself over the years about the nature of his relationship with Putin. 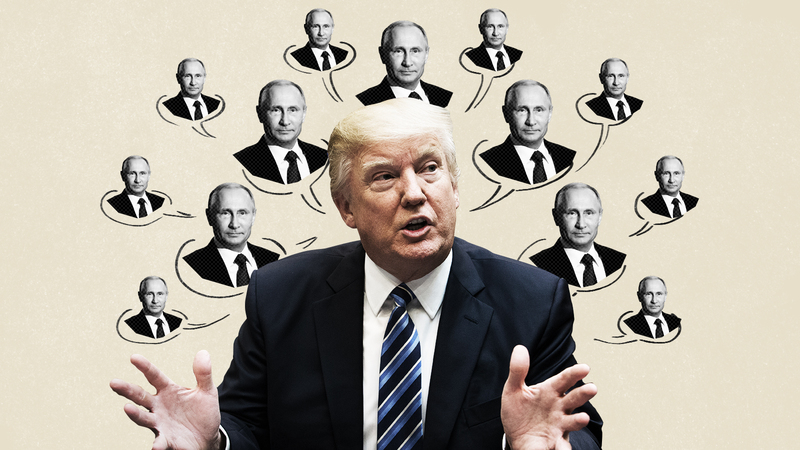 Since 2013 — when Trump’s Miss Universe pageant was held in Moscow — Trump has at least nine times claimed to have spoken to, met, or made contact with Putin. But as the 2016 campaign wore on and his statements on Putin began to attract more scrutiny, Trump changed course, denying having ever met the Russian president. “I know for a fact that he wants very much to come, but we'll have to see. We haven't heard yet, but we have invited him,” Trump said. "Well Mitt Romney was so right, and nobody knew how right he was going to be, and you look at Obama's response and just take a look at what's going on," said Trump. "Syria was propped up by Russia. Syria's now back in their fold 100% and that whole deal is coming to an end because Russia's taken over." Trump tells NBC's "Today" that the US should “definitely do sanctions” against Russia for their aggression in Ukraine. "Well, Mitt was right, and he was also right when he mentioned in one of the debates about Russia, and he said, 'Russia's our biggest problem, and Russia is, you know, really something,'" Trump said. Trump tells Fox Business’ Eric Bolling that Putin was nice to him during Miss Universe. In the same interview, Trump praises Putin’s invasion of Crimea. Speaking at the National Press Club, Trump says he spoke “indirectly and directly” with Putin at Miss Universe. “I think I became much richer because I can understand people and read people and Putin is not finished. Putin has got a long way to go,” Trump says. Trump tells Fox News host Neil Cavuto that Putin is like a “wounded animal” due to the Obama administration’s actions against Russia. Trump also said he received “a gift from Putin – an award and a beautiful letter.” He does not confirm or deny meeting with Putin when asked. Trump makes similar comments to Fox News’ Bill O’Reilly. Trump answers “yes,” when asked by Fox News' Sean Hannity if he’s had any contact with Vladimir Putin. Speaking on Putin, Trump says he “got to know these guys well” during Miss Universe. Trump tells CNN’s Anderson Cooper that if he becomes president, Putin would turn over Edward Snowden to the US. "@bluestarwindow: @realDonaldTrump @bdean1468 Putin knows that Obama is a danger to the world. Putin will respect President Trump" True! Trump also said Putin “hates Obama and Obama hates him, we have unbelievably bad relationships." Trump says on Fox News that he would meet with Putin when the Russian president came to New York for the UN General Assembly. Trump says that Putin “hates Obama,” but that he would get along great with the Russian president. "@Apipwhisperer: @MarkPavelich @gentlemanirish @60Minutes EXCELLENT WATCHING PUTIN'S BRILLIANCE AND TRUMP'S. @CBS I LOVED THE INTERVIEWS." Trump tells Bill O’Reilly that Putin gets an ‘A’ for leadership. "I will tell you that I think in terms of leadership, he is getting an 'A,' and our president is not doing so well," Trump said. "They did not look good together." Trump tells conservative radio host Michael Savage he’s met Vladimir Putin. Trump said on CBS’s “Face the Nation” that he and Putin had “fantastic ratings on ‘60 Minutes’ together” and again said he thought they’d get along well. "I think the biggest thing we have is that we were on '60 Minutes' together and we had fantastic ratings. One of your best-rated shows in a long time," Trump said. "So that was good, right? So we were stablemates." Trump asserted in an interview with the Guardian that Putin was going into Syria to combat ISIS. “He’s going to want to bomb ISIS because he doesn’t want ISIS going into Russia and so he’s going to want to bomb ISIS. Vladimir Putin is going to want to really go after ISIS, and if he doesn’t it’ll be a big shock to everybody,” Trump said. Told Bill O’Reilly that Putin was his “stablemate” on 60 Minutes. He went on to say, "I got to know (Putin) very well because we were both on ‘60 Minutes,’ we were stablemates, and we did very well that night. But, you know that." “But, if Putin wants to knock the hell out of ISIS, I’m all for it 100% and I can’t understand how anybody would be against that,” he added. Trump walks back his Putin stablemate comment, saying his 60 Minutes segment was separate from Putin’s.
.@CarlyFiorina I only said I was on @60Minutes four weeks ago with Putin—never said I was in Green Room. Separate pieces—great ratings! He added: "I think our country does plenty of killing also, Joe, so you know. There's a lot of stupidity going on in the world right now, a lot of killing going on, a lot of stupidity." In an interview with ABC’s “This Week,” Trump defends against allegations Putin has ordered the killings of journalists and dissidents. In an interview with Fox Business’ Maria Bartiromo, Trump discusses the 2006 murder of Alexander Litvinenko, a former Russian security agent, and the 2016 findings of a British inquiry that Putin “probably approved” his poisoning. Trump says at a news conference he’d be a better negotiator with Putin than his rivals. Trump says at a rally that he has no relationship with Putin. Trump says at a press conference that he can’t imagine Marco Rubio meeting with Putin. Trump says at campaign rally in Alabama he’d be a better negotiator with Putin than his rivals. He says Putin has been “very nice” to him. "I'm saying that I'd possibly have a good relationship. He's been very nice to me," Trump told Bill O’Reilly. "If we can make a great deal for our country and get along with Russia that would be a tremendous thing. I would love to try it." Asked if he’s ever spoken to Vladimir Putin, Trump gives a “no comment” to Fox News’ Bret Baier. Trump calls Putin “a strong leader” at a rally. At a rally in California, Trump mocked those who wanted him to “disavow” Putin’s praise of him. “Then Putin said, ’Donald Trump is a genius, he’s going to be the next great leader of the United States.’ No, no, think of it. They wanted me to disavow what he said. How dare you call me a genius. How dare you call me a genius, Vladimir. Wouldn’t it be nice if we actually got along with Russia? Wouldn’t that be good?" In the same news conference, Trump called on Russia to find Hillary Clinton’s deleted emails as secretary of state. Asked about Putin’s previous invasion of Crimea, Trump said, "OK -- well, he's there in a certain way. But I'm not there. You have Obama there. And frankly, that whole part of the world is a mess under Obama with all the strength that you're talking about and all of the power of NATO and all of this. In the meantime, he's going away. He takes Crimea." “And I'm saying to myself what's wrong with that? That's good,” Trump said. Trump says in a town hall with NBC’s Matt Lauer that he considers Putin a stronger leader than Barack Obama. Trump tells radio host Michael Savage that he might meet with Putin prior to the start of his administration. In the interview, he also said that Clinton shouldn’t talk “so tough” on Russia, saying "She talks tough with Russia. She shouldn't be talking so tough. Frankly, if we got along with Russia and knocked out ISIS, that would be a good thing, not a bad thing." He further denied having met Putin and said that Putin had “outsmarted” Clinton and Obama. “He won't be doing it. Russia will have much greater respect for our country when I am leading it than when other people have led it,” Trump said. Trump also said he believes a good relationship with Putin would be an asset. "If Putin likes Donald Trump, I consider that an asset, not a liability, because we have a horrible relationship with Russia. Russia can help us fight ISIS, which, by the way, is, number one, tricky. I mean if you look, this administration created ISIS by leaving at the wrong time. The void was created, ISIS was formed." Trump says he respects Putin during a Super Bowl interview with Bill O’Reilly. Trump defends Putin when O’Reilly calls him a killer. “And I can tell you, speaking for myself, I own nothing in Russia. I have no loans in Russia. I don't have any deals in Russia. President Putin called me up very nicely to congratulate me on the win of the election,” Trump said. CNN's Tal Yellin, Ivory Sherman and Will Mullery contributed to this report.